Sorry that things have been a bit food-heavy around here lately, but holidays and days off work do tend to result in lots of cooking and consuming round here. Few things in life make me as happy as a good sandwich and Thomasina Miers’ torta – or Mexican club sandwich – tops the list for me. Chorizo, refried beans, lard-soaked bread… What more could you want? It takes a little while to construct, but not long enough to put you off. It is kind of a beast in terms of nutrition though, so I tend to restrict my consumption to birthdays and bank holidays – both of which we have this week soooooo….? Mention the word “torta” to anychilango (someone who comes from Mexico City) and you will see a faraway look come over them as they are transported back to the torta stands that line the streets of the capital. 1. Slice the tomatoes up and stick them in a dish with salt, pepper, the chilli and some olive oil. I like to rub it all in so that it’s evenly covered. 2. Slice the chorizo into pound-sized chunks and heat them up in a pan – I never add oil or anything when cooking chorizo, the juices are good enough alone. Cook for a few minutes until it’s nice and crispy. I also like to heat the refried beans up at this point if you haven’t just made them from scratch. 3. Scoop the chorizo out and brush both sides of your ciabatta buns with the chorizo fat and a little extra lard. YUM. Grill for a few minutes until they’re crispy too. 4. 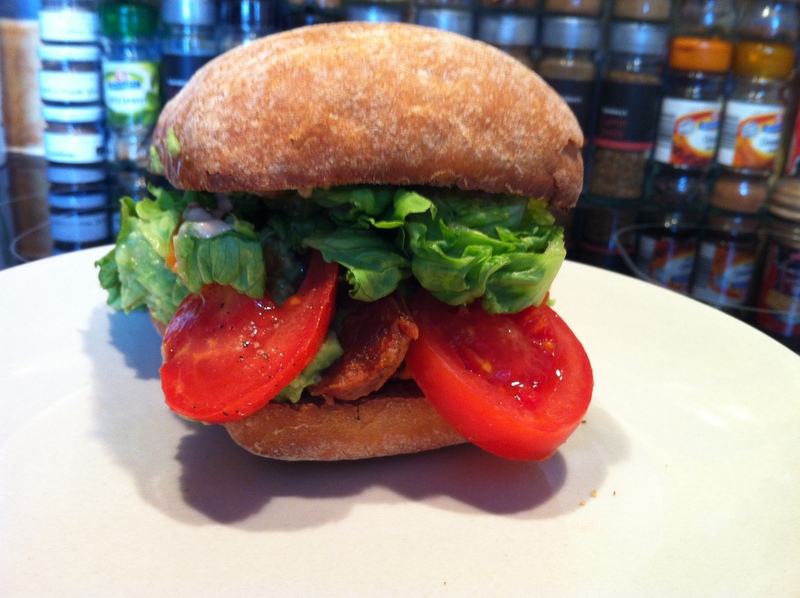 Smear one half of the bun with refried beans and top with chorizo, avocado, red onion, tomato and lettuce. Doesn’t that already sound like the best thing you’ve ever eaten? 5. SMEAR the other half in the mayonnaise, squidge together, eat. Thomasina also suggests using chicken, steak, pork or fish instead of chicken – or grilled courgettes, mushrooms and corn fresh from the cob for a veg option.